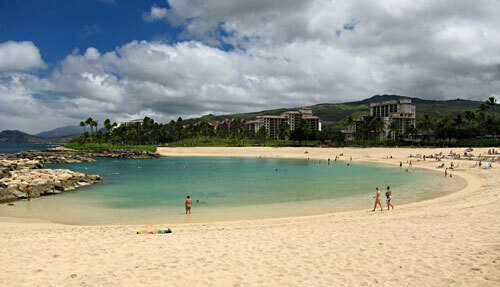 There are a number of reasons we recommend snorkeling Ko Olina Lagoons. 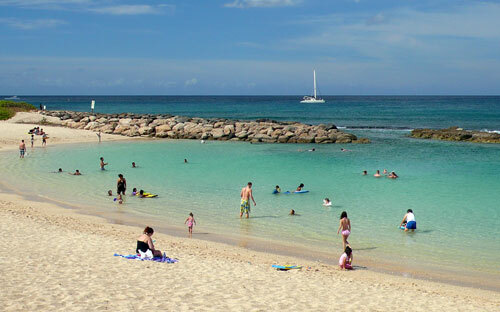 These lagoons offer some very safe snorkeling. 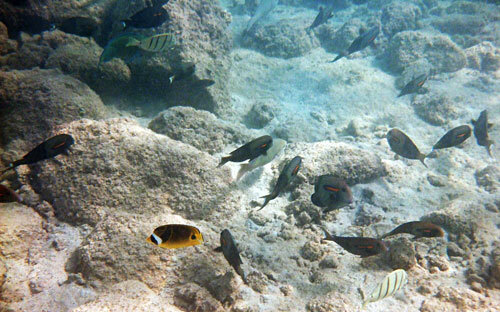 They are very protected and are probably the most accessible snorkeling spots year-round on Oahu. Most of the time the lagoons are great for beginners and kids because they are protected and calm, but everyone will have fun seeing all of the fish and possibly turtles. We have been there on some very windy and wavy days, and the lagoons were calm. If big waves happen to be breaking over the rocks, it is not going to be a good day for snorkeling Ko Olina Lagoons. It will be too rough and the visibility will be awful. But in our experience, this is not common. There are four man-made beautiful sandy beach lagoons fronting property that is gradually being developed with various resorts. 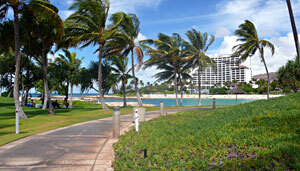 The Ko Olina Lagoons have a clean resort feel to them with grass and palm trees planted everywhere. They each have restrooms and showers and there is a nice walking path that connects them all. The path is about a mile and a half long from lagoon #4 to lagoon #1. 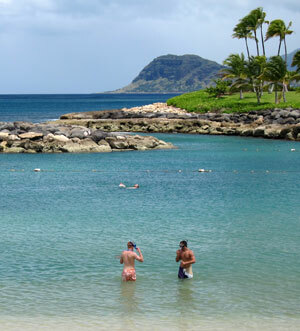 A couple of downsides to snorkeling Ko Olina Lagoons are that there is really no interesting reef or coral to explore here and the visibility is often not great. Another downside is that the beaches and snorkeling areas can get crowded and this will be worse when the area is more filled up with resorts. Also, there is limited public parking. We advise that you come early to get a spot. Lagoon #4, the southernmost one, has the most public parking and is the most popular with folks not staying in the resorts. So we found it best to just drive to lagoon #4 and park, and then walk down the nice path to the other lagoons. The other three lagoons have less than 20 parking spots at each one. But, if you arrive early enough, you can likely park at any lot you want to. 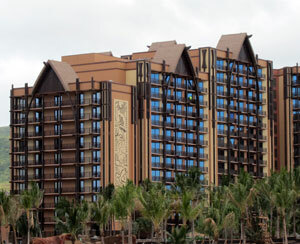 There are currently four resorts at Ko Olina: the Aulani Disney Resort & Spa and the Four Seasons Resort Oahu at Ko Olina are on lagoon #1, Beach Villas at Ko Olina is on lagoon #2, and Marriott's Ko Olina Beach Club is on lagoon #3. For the next several years you can expect that there will be more resorts being constructed. These beautiful sandy lagoons are maintained with a sandy bottom, so barefoot entrance is easy for snorkeling Ko Olina Lagoons. Enter anywhere and swim toward the rock barrier. The lagoons are all made in a similar way. They have several cuts made into the rocky ocean barrier that allow sea water to flow in and out. The current flows in the sides and exits out one or more of the middle channels. In the channels with incoming water, you can swim right into the rock cuts until you come against the breakwater as long as the waves coming in from the ocean are mild. The middle channels are often roped off and you want to avoid swimming in them so that you don't get caught in the current and sucked out into the open ocean. We do not recommend that you swim outside the lagoons in the open ocean. Snorkeling Ko Olina Lagoons is along this rocky barrier to the ocean. The snorkeling areas are not particularly large. The rocks that create the barrier to the ocean have a few corals growing on them, some urchins burrowing though them and a lot of fish using them for places to hide. 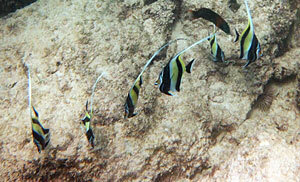 We often see a good number of fish, a lot of them immature. 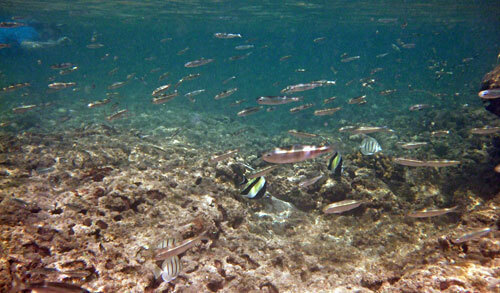 The visibility in the lagoons is not perfect because of all the sand, but it is often decent. The depths around the rocks varies between at the surface down to about 4-5 feet. 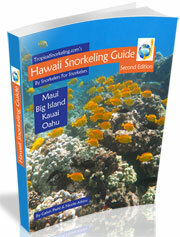 Our Hawaii Snorkeling Guide eBook includes information for every main island, and there are more pictures, a map and rankings for Ko Olina and other Oahu spots. 5. Follow Hwy 93 a short distance and take the exit to the Ko Olina resort area. You will be on Ali’i Nui Drive. 6. The four lagoons each have at least one small public parking lot and path to the beach. They are well marked on the right side of the road. The first one will be Olani Street for lagoon #1. The second turn is Kamoana Place also for lagoon #1. Next is Waiali’i Place for lagoon #2. After that will be Mauloa Place for lagoon #3. And last is Waipahe Place for lagoon #4 with the largest public parking lot. 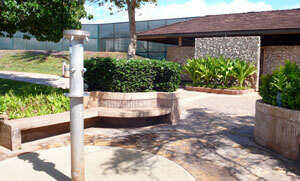 There are restrooms, showers, drinking water and shade at each lagoon.